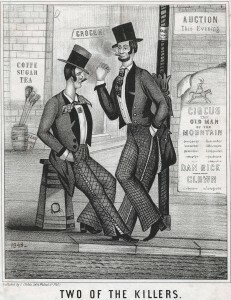 This 1848 lithograph published by J. Childs illustrates two nameless members of the South Philadelphia gang known as the Killers. They are dressed in their ostentatious tails and plaid pantaloons, and one wears a similarly “precocious beard” that Lippard’s character Cromwell bears on his chin. His comrade sits on a fire hydrant, repeating a posture found on the cover page of The Killers. The South Philadelphia Irish gang was historically associated with the Moyamensing Hose Company. The man also wears a pin that holds a single initial, “k,” below his collar, perhaps solidifying his associations. The signage behind the men advertises a local auction and a circus put on by the famous performer Dan Rice. Rice was a household name in pre-Civil War times and rivaled Phineas Taylor Barnum of Barnum & Bailey fame. This scene retells the surveilling presence of the historic Killers in their territory. This cover page of George Lippard’s The Killers likely shows two members representing the real South Philadelphia gang known as the Killers. 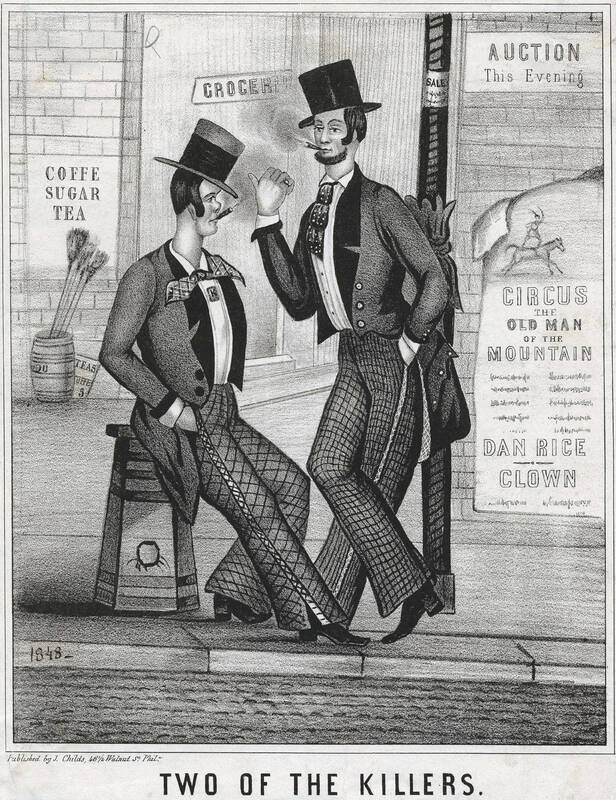 The Irish gang that ruled the Moyamensing neighborhood in the 1840s was also known for its business in the fire hose industry. In this lithograph, one figure sits upon the nineteenth-century version of a fire hydrant, suggesting their allegiance to the organization. 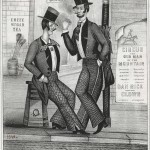 Their dress closely resembles an 1848 print by J. Childs of two members of the Killers gang, which also matches a description of Lippard’s antagonist, Cromwell Hicks, in the beginning of the novel. Three main characters, including Cromwell, are listed for their pivotal involvement in Lippard’s sensational retelling of the California House Riot that occurred in South Philadelphia on the night of the 1849 election. Lippard and his socially conscious works of historical fiction rose in popularity to outsell his contemporary, Edgar Allan Poe. This portrait of author George Lippard is an engraving done by the artist J. R. Telfer in 1922, over sixty years after Lippard’s death. Lippard was born on a farm in Chester County, Pennsylvania, where he lived until his parents were too ill to maintain the homestead and relocated to Philadelphia. George was raised in the home of his grandfather and two aunts, where he was groomed to work in the Methodist ministry, which he found did not meet his moral standards in practice. He then began training to become a lawyer, which also caused him moral reservation. An unemployed Lippard wrote in the popular gothic romance style and saw his social and financial standings rise from impoverished beginnings. Meanwhile, the city’s societal and economic tensions were heightened as a result of the economic and political maneuvering of the powerful elite. Lippard sought to record the social disparities he witnessed in Philadelphia, while maintaining his sensationalist voice in retellings of contemporary history. Lippard’s working-class hero, Elijah Watson, is introduced in his solitary cell at Eastern State Penitentiary, located on Fairmount Avenue at Twenty-First Street. 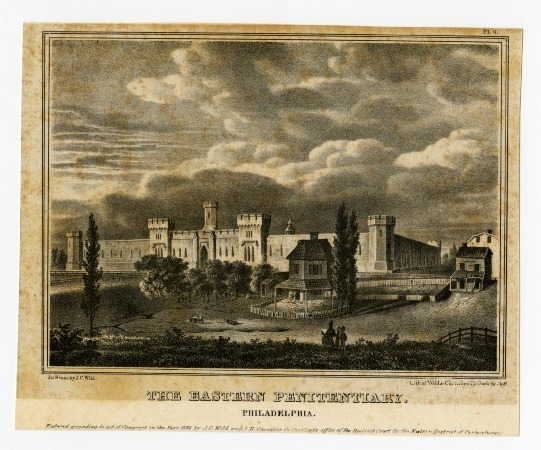 By the first publication of The Killers in 1849, Quaker-inspired Eastern State had become the model for prison reform in the United States, having introduced the new Pennsylvania System at its 1829 opening. 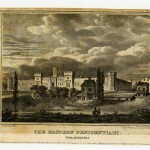 In this lithographic etching, the Gothic architecture of the prison appears even more eerie under the rolling, gray clouds. The prison's design direction was intended to instill fear and regret in would-be criminals. While Lippard’s socialist leanings aligned with Quaker social values of equality and peace, the Quaker methods of penitence ultimately failed to resolve the larger issue of incarceration rates among the poor. Lippard’s 1851 novel The Bank Director’s Son shares the characters of Cromwell, “Bulgine,” and Kate Watson that appear in The Killers. The text with this image recounts a retelling of Cromwell witnessing a murder carried out by Black Andy. Irish immigrants flooded the resident population of free African Americans who lived between Fifth and Ninth Streets and South and Fitzwater Streets in South Philadelphia. Tensions climaxed in the two-day riot at the California House at Sixth and St. Mary Streets when the Killers responded to a rumored interracial couple residing there. Interracial ties reappear in the presence of the black character and the Irish damsel, Kate Watson, in The Bank Director’s Son. Lippard chronicled these racial tensions in a serial release of a version of The Killers that appeared in his self-published weekly paper, The Quaker City. The adapted Cromwell presented in this illustration appears again in the same dress described in the first pages of The Killers. Here we can see his white shirt and dark tie pairing, as well as the plaid pantaloons explained by Lippard in his introductions of Cromwell and Don Jorge as college students. The Killers is a sensational urban gothic tale written by the journalist, novelist, and labor activist George Lippard (1822-54) in 1849. It exposes Philadelphia’s class and racial conflicts and its gang warfare, criticizes corruption in government and finance, and lambasts the city’s new experiment in incarceration, the solitary confinement system of Eastern State Penitentiary. 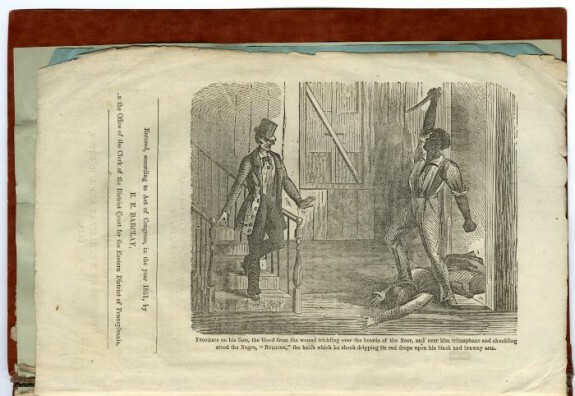 Illustrated by the well-known artist Felix Octavius Carr Darley (1822-88), The Killers dramatizes and politicizes the social transformations overtaking the city in an age of mass immigration, industrialization, financial instability, and growing tensions over race and slavery. By the time he wrote The Killers, Lippard was famous for the 1844 publication of another urban gothic novel, The Quaker City; or, Monks of Monk Hall, which was among the best-selling American novels before Harriet Beecher Stowe’s (1811-96) Uncle Tom’s Cabin. 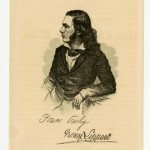 In The Killers, one of many “city mysteries” inspired by the rapid expansion of urban areas and by French writer Eugène Sue’s (1804-57) Mysteries of Paris (1842-43), Lippard depicts the disintegration of the family of Jacob D.Z. Hicks, a wealthy Philadelphia merchant. Hicks’s illegitimate but pampered son Cromwell is disowned by his father thanks to his own profligacy and his mother’s leaving his father. Hicks’s wife, as she dumps him for an English baronet, reveals that his real son, Elijah, had been raised in a poor family (with Kate Watson, whom Elijah considers his true sister). Elijah is imprisoned in Eastern State Penitentiary for four years for passing a false note on a bank Hicks owns. When he discovers that Hicks is his true father, Elijah vows revenge for his abandonment, and to get it, eventually joins the notorious South Philadelphia gang “The Killers.” By that time, the disowned Cromwell is the leader of the gang. 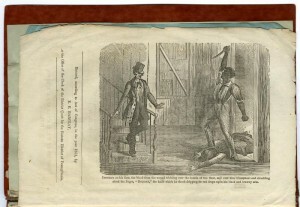 The California House Riot, which began on October 9, 1849 (election night that year), served as the real-life inspiration for the story. The California House, in the African American neighborhood around Sixth and St. Mary Streets, was a business owned by a black man who had been rumored to be married to a white woman. It became the epicenter of a violent riot involving local African American residents, working-class Irish gangs, fire hose companies, and the city’s police and militia. The riot is the climactic episode of The Killers, which describes it as having been triggered by a revenge plot created by Cromwell in cahoots with Don Jorge, the disaffected son of Hicks’s Cuban partner in the illegal slave-importation trade. Don Jorge’s father had been left to die by Hicks on an ill-fated slave-trading journey; Don Jorge befriends Cromwell and involves him in his own transatlantic slaving ventures, hardening him for the violent plot against Hicks to come. Hicks, reappearing after having gone underground for a few years, plots with Black Andy, the black owner of a grog shop, to abduct Kate, who has caught his eye while working as an actress, for unnamed evil purposes. Thus exposing himself to the simultaneous revenge plots of Cromwell and Elijah, Hicks on the night of the riot finds himself imprisoned in the grog shop along with Kate. After Black Andy, defending his establishment, kills Cromwell, the Killers set the building on fire, ultimately killing Black Andy and Hicks—but not before Black Andy saves Kate from the flames. 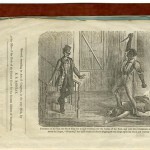 Don Jorge meets his end in the act of looting Hicks’s hidden hoard, shot by a gun in a booby-trapped box containing the records of Hicks’s illicit trade in slaves. His death leaves the money to be snapped up by Elijah, who uses the funds to carry himself and his half-sister Kate to safety in Panama and then California. 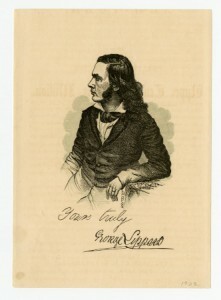 Four versions of George Lippard’s novella The Killers were published between late 1849 and 1851; only the last, under the title The Bank Director’s Son, bore Lippard’s name as author, as previous versions had been anonymous. 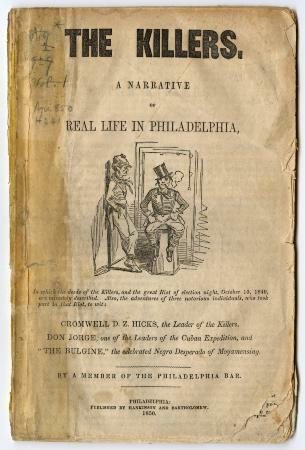 Few copies of The Killers and its related titles are known to survive, but versions are held at the Historical Society of Pennsylvania and the Library Company of Philadelphia. Three of the versions are identical with the exception of their titles. A short pamphlet edition of the text, The Life and Adventures of Charles Anderson Chester (1849), features many of the same characters but lacks the Cuban dimension of the narrative, and reads more as an indictment of gang violence than an attack on the corrupt elite in finance and governance. 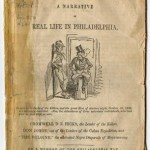 There are no known reviews of the novella, so it is difficult to say anything concrete about its reception, but the fact that it was issued several times suggests at least modest popularity in Philadelphia. The Killers reveals a Philadelphia torn by conflicts over race, class, ethnicity, and visions of the city itself. At the same time, its idealism and passages of historical description–woven into the narrative at a series of well-known Philadelphia sites—exhibit a sense of pride and the persistence of utopian hope in the city that characterize it from its earliest days. And while its sketches of Philadelphia and its denizens are cast in the chiaroscuro of the urban gothic, they, together with the various editions’ illustrations, provide a vivid sense of the city’s mid-century social topography. 15, 22, and 29, 1849. Book History 11 (2008): 149–67. City Life. Philadelphia: E. E. Barclay and A. R. Orton, 1851. Cohen and Edlie Wong. Philadelphia: University of Pennsylvania Press, 2014. York: Oxford University Press, 2010. Reynolds, David S. George Lippard. Boston: Twayne, 1982. Rare books, Historical Society of Pennsylvania, 1300 Locust Street, Philadelphia. Rare books, Library Company of Philadelphia, 1314 Locust Street, Philadelphia. Site of the California House Riot, Sixth and Rodman Streets (Rodman was known as St. Mary Street at the time of the riot), Philadelphia.